Some landowners of ag-zoned parcels in Oahu received the “ NOTICE TO AFFECTED LANDOWNER IMPORTANT AGRICULTURAL LANDS (IAL) PROJECT” dated December 29, 2016 from the Honolulu City and County’s Department of Planning and Permitting. That December 29, 2016 letter was probably the first time that many landowners had heard about “IAL”. Two meetings were made available to the public. One was held in Kapolei and the other was on January 17, 2017 at the Hale‘iwa Elementary School Cafeteria. Why is the city doing this IAL Project? 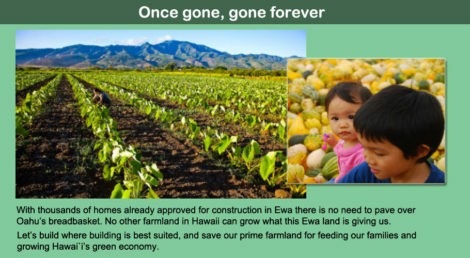 If the intent was to “promote agriculture and the conservation of productive agricultural lands in the State”, why exclude the 1,555 acres of fertile Aloun Farms (Ho’opili) which contributed 30% of greens to Oahu and has 4 –season plantings. Why exclude 760 ag-zoned acres in Koa Ridge? If its intention was to allow tax credit and incentives, why not offer to ALL farmers? Does IAL appear to favor the large landowners? What happens to the 50% of the large landowners’ agricultural lands that CANNOT be designated as IAL? What happens to all the other agricultural lands that are NOT designated as IAL? Why are some steep agriculture lands designated as IAL while other fertile lands not designated as IAL? Why were some landowners not initiated by DPP while others were? Why is DPP now unilaterally placing small ag-zoned landowners into this IAL Project instead of allowing the small land owners to opt into this IAL Project? The Land Use Research Foundation (LURF), which often represents the interests of large landowners before the Legislature, did not respond to inquiries about the 50 percent limitation by press time. However, the measure undoubtedly gives LURF’s constituents who want to develop their ag lands more flexibility. 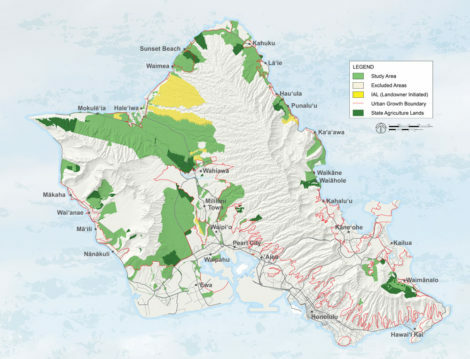 For example, in its 2006 annual report, Alexander & Baldwin notes that of its 59,320 acres of agricultural or pasture lands and 29,270 acres of conservation lands 8,700 acres have “urban potential.” Hawaii Environment Report Feb. 2008. Tune in to Country Talk Story – Olelo Channel 54 Sundays 4:00 pm during February to listen to the January 17, 2017 IAL meeting.